You know, I have to admit, as much as I’m looking forward to watching The Great Gatsby in theatre, I am even more interested in the 1920s-inspired fashion that will come from it. I’ve seen a bit of celebrity fashion that has well and truly brought the 1920’s back; the most recent being Chris Pine on CONAN. You’d think I’d be able to find a pic, right? Maybe I’ll find it again on Rogers on Demand, ’cause he had a serious suit on. ANYWAY, so there are some fabulously inspired dresses and head gear, and shoes, OH THE SHOES! If Gatsby fashion really kick-offs, prepping my closet is going to be extra fun this season. Have you seen any roaring twenties vintage shoes lately? TheHubs is in so much trouble in that area alone. I might need a new closet if I pick up all the vintage-y shoes that I’ve found and love recently! One thing you don’t get to see too much of though is sunglasses. In fact, my best source of inspiration was actually from Leonard Di Caprio’s two pairs of sunglasses in the movie. Yeah, that’s about it (without actually seeing the movie yet.) But with sunny days ahead, I am going to need some fabulous shades to go with shiny vintage looks that I now want to pull together. It seems like the one key ingredient to 1920’s vintage looking sunglasses is the roundness factor. So I went to the Smart Buy Glasses website and went searching for Round. One thing I love about this site: you can be really specific for what you’re looking for (shape, colour, tint, material, price) among their 150+ designer labels, like Prada, Bvlgari, Gucci, etc. Quite possibly the pair that I covet most, Tom Ford’s Carrie sunglasses in Grey Brown Horn, and Brown tinted shades. *so much love* It has a beautifully rounded frame, with quite a bit of dramatic flare for any occasion. 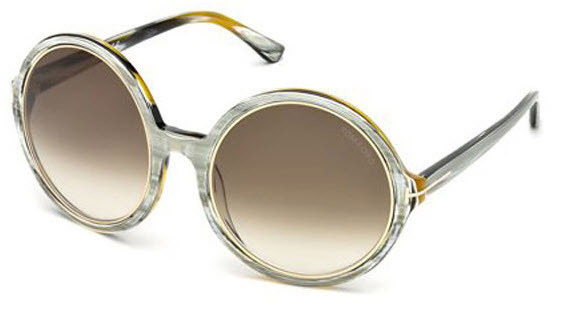 Roberto Cavalli’s Zinnia has a nice modern twist for a round-ish frame. What I like most is that while its almost over-the-top as what you’d find in 20’s era fashion, it has a sophistication about it too. Lacoste L112S 714’s again have that sophisticated pre-Hepburn vintage look about them. 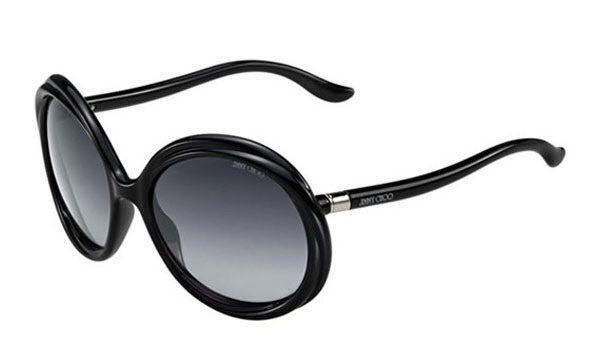 Jimmy Choo Mindy sunglasses are a fabulous pair that can go with any outfit, day or night. Miu Miu MU13NS are very close to a pair that DiCaprio wears if I remember correctly. Do you have a favourite pair that totally speaks to the roaring twenties fashionista in you?? I would love to see your choices! Thanks to SmartBuyGlasses.ca, you have a chance to win a $150 gift card that is good towards any purchase you want on their site!! There are a TON of fabulous, designer sunglasses to choose from at up to 40% off, and all of which include free shipping and a $25 lens kit! WOOT! I mentioned above one reason why I love this site, well here’s another: Their Buy One, Give One program. When you purchase a pair of glasses from their site, someone in need gets a pair too! SmartBuyGlasses.ca works with carefully selected charities to ensure the people who need glasses the most will get them. From their site: “In the villages, the local ophthalmic nurses and optometrists examine, diagnose, and provide quality treatment to patients. After the diagnosis, each patient is given a donated pair of personalized prescription frames. The final fitting is performed and we are one step closer to eliminating impaired vision.” So far SmartBuyGlasses.ca have donated $1,000,000 worth of glasses and I for one would love to help them give more! I’m not so fashionable as to pull off the Great Gatsby fad, but in the styles you picked were great! Love those classic frames! Round shapes can be hard to pull off, but look amazing when done right. i love the Great Gatsby style! I love those glasses. I think I had a pair like some of them, but my favorite are the Roberto Cavalli. These are fabulous!! I could totally see you rockin’ looks from the roarin’ 20’s! I like the Tom Ford Whitney glasses,so chic! I can’t wait to see this movie for the fashion, too!! Unfortunately, my face can’t do round glasses but I love the look of them on other people! my favorite are the Roberto Cavalli. Ray Ban RB2140 Original Wayfarer speaks very loudly to me although I love the Gatsby looks, too. I love the classic Rayban wayfarer. I owned a pair 30 years ago that I have since lost and would love to replace them! I love anything round, and tortoiseshell! So many great choices at smartbuyglasses! I’m still a fan of the classic Rayban Original wayfarer sunglasses. i love the michael kors sunnies! and i love the great gatsby theme! Chloe CL 2189 C04. I am definitely looking for something for this summer. Love the Mui Mui & always have loved vintage fashion styles!!!!! The Fendi FS 5003 1 is totally speaking to me! Love the classic look. I like the Dolce & Gabbana DG2106K Folding Polarized 1028/57 A. I lost my D&Gs in a windsurfing accident a few years ago and have been sunglass-less ever since. Finally, this pair is the perfect replacement! I like theGucci GG 3537/S 5E9/DX. Looking for something that will last for a few years since some of these glasses are so expensive! Fendi FS 5117 001 they are fabulous !!! the Jimmy Choo glasses are great! These Versace VE2129B 100068 are really funky! I’m looking for a pair of solid aviators!! Love the Christian Dior MY MISS DIOR F V08/HA! Marc Jacobs MJ 119 COV/ZW. I love all of these glasses so much. I didn’t even realize that Gatsby inspired sunglasses were a thing. Glad I stopped by! I love all the retro rayban designs “grampa jones” and the wayfares! Jimmy Choo Mindy sunglasses – awesome! I am in love with the Roberto Cavalli’s Zinnia glasses from your article. I love the Fendi FS 5003 1. something simple and goes everything I own. This giveaway is making me want to buy a new pair of sunglasses NOW!! Today I’m in a valentino kinda mood…I’m liking this one. When will we see some picture of your sporting these great Gatsby styles or maybe some of the Rayban Wayfarers I love so much? I really like this pair of Fendi glasses. Classic! I like these ones: Alexander McQueen AMQ 4156/S TER/SH. A little different than what I would usually pick, but still classic. Coach Victoria HC8002 505311 since it’s 40% off now. Oh thanks for that tip. I love the Lacoste L112S 714 that you featured! I like the Prada PR03MS ZYZ5I1. you know I love the Rayban Wayfarers in the classic black and some stylin’ red lipstick and I am ready to go! I actually really like a lot of these 20s inspired looks – they go with my face structure! ooooooooo LOVE these Emilio Pucci EP 646SR 609 sunglasses! !